Discover the health benefits of kneeling chairs: improve your posture and eliminate back pain from the comfort of your desk. If you spend any extended amounts of time at the desk, whether it be at work or the home computer, you've probably experienced some degree of back pain. Sitting for long periods of time can lead to chronic back pain issues because of gravity's constant pressure of the spine. Some initial discomfort eventually leads to chronic pain and even injury such as bulging or herniated disks, which can be extremely painful and hard to reverse. In 1970, a Norwegian named Hans Christian Mengshoel came upon a unique solution for the office worker. Mengshoel invented this ergonomic design, a alternate solution to the traditional 90 degree chair, in which the person kneels down on a supportive rest, allowing the thighs to slope downward. This position allows the spine to easily stack upright, making ergonomic alignment effortless. The inspiration for this idea came from two sources. Since ancient times, Buddhist monks had been noted for their ability to sit countless hours in prolonged meditation. They often use a kneeling position, with the knees pointing forward. In addition to this observation, ergonomists had noticed that children often lean forward while seated. This innate human action is done naturally with the goal of straightening the spine. Combining these two observations, the kneel chair was invented. Most people find that this simple ergonomic solution will give you immediate relief. If you're one of the many who experience chronic back pain due to sitting, then an ergonomic furniture piece is most certainly a feasible solution. Many report that by simply switching to a kneeling chair, whether it be a permanent swap or a back-and-forth alternation, their back pain quickly starts to go away. In this hub you'll find out why these products work, which would be best for you, and the resources on where to purchase one. How Do They Help Your Back? Our whole lives, we become accustomed to sitting in a traditional chair where the thighs and the upper body and compressed into a 90 degree angle. Over time this compression of the hips starts to shorten the muscles along the front of the body connecting the hips to the thighs. Most people find that they feel 'pulled' forward while sitting in a chair, moving closer to their computer screen. This is the body's reaction to becoming accustomed to a traditional seat. 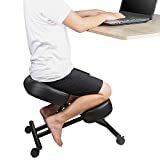 With an ergonomic kneeling chair, the angle between the upper torso and the thighs is increased to an angle greater than 90 degrees (typically 105-120). This allows the upper body to remain vertical without any effort. The vertebrae of the spine can stack on each other while the supportive muscles of the spine do not need to engage to prevent the body from falling forward or backward. The angle of the ergonomic seat also takes more pressure off of the spine. Depending on the angle of the slope, the knees (supported by the shin rest) will take a portion of gravity's pressure. Again giving the back muscles some added relief from the strain of sitting. Another subtle benefit is the alignment of the pelvic bowl. Commonly heard in yoga class, you might hear phrases such as "tuck the pelvis" or "tilt the spine towards the floor." This action, also incurred by sitting in an kneel chair, will lengthen the spine and protect the disks near and around the sacrum. These three inherent benefits to the posture chair combine to create a revolution in the way we sit. These furniture pieces can relieve back pain and reverse damage caused by sitting for years uncomfortably in a traditional 90 degree chair. 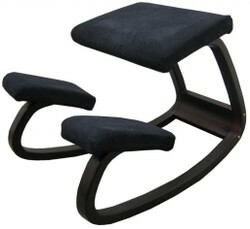 Adjustability is the utmost key feature when selecting an ergonomic knee chair. All people are build differently, with different heights and different degrees of comfort in which they can sit. An adjustable chair gives you the flexibility to change the angle of the slope of the seat. This allows you to take more pressure off of the shins in case they start to get sore. Also it allows you to increase the angle of the seat, to take more pressure off of the spine and the body can more easily achieve a vertically stacked spine. One of the key factors to remember in ergonomics is not to remain static, sitting in one place for an extended period of time. A rolling base gives you the freedom to rotate in your work space. Also, you can take one knee off of the shin pad and place the corresponding foot on the floor. By simply rocking back and forth, you are lubricating the joints of the body, and making your joints happy. Folding chairs are great for portability. It can collapse into a virtually flat piece, letting you transport it easily between home and work. In addition, folding chairs stow away quite well as they can slide underneath the bed with no difficulty. According to professional reviewer Kneeling Office Chairs (KneelingOfficeChairs.com), the highest rated and best selling product is produced by Office Star. It features memory foam cushioning, which is very nice on the shins and holds up well over time. Both new users love it for the comfort, and experienced users love it because it lasts. The rolling base makes encourages you to move around. A key factor in ergonomics is to stay moving and avoid being stagnant. The fact that this seat allows you to roll, will cover that base. Lastly, this chair has style. The mahogany wood finish looks great in the office place, giving of a professional look, while still being a great asset for you posture and health. Do You Currently Use a Kneeling Chair? No, but I'm interested in getting one. I have been looking for one of these but didn't know what it was called. I don't have back problems but this chair just looks more comfortable to use for long periods. You did a great job on this page. Excellent information on a great ergonomic product.